alaTest has collected and analyzed 70 reviews of Sony WI-1000X. The average rating for this product is 4.4/5, compared to an average rating of 4.0/5 for other Headphones for all reviews. People are impressed by the size and comfort. The usability and noise isolation are also appreciated, whereas some have doubts about the bass quality and price. We analyzed user and expert ratings, product age and more factors. 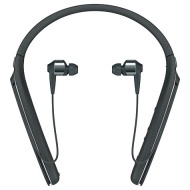 Compared to other Headphones the Sony WI-1000X is awarded an overall alaScore™ of 95/100 = Excellent quality. Sony's earphone game is getting stronger by the year, with its latest wireless earphones being testimony to that improvement. The WI-1000X are, without doubt, among the best in-ears we've tested in a while. High-quality audio performance with sculpted, but balanced sound signature. EQ allows for sculpting audio to your taste. Excellent noise cancellation. Comfortable fit. Easy-to-operate design. Generous array of accessories. Sound signature not for purists seeking accurate, flat response. The pricey around-the-neck WI-1000X wireless noise-cancelling headphone is set to take on Bose's QuietComfort 30. Good noise isolation and low leakage. ; Good controls. ; Can also be used wired. Slightly sharp on already bright tracks. ; In-ear, neckband design won't be for everyone.